This before and after feature by the homify team, concentrates largely on the chic makeover of an old and distasteful kitchen. The interior designers have completely reinvented this unimaginative cooking space, adding some gourmet style and classic features instead. Although this kitchen was not lacking in colour, it made no impression on the actual kitchen, and instead looked dull and uninteresting. The blue-grey kitchen cabinets created that much needed update, while adding an almost vintage feel with some modern accents. 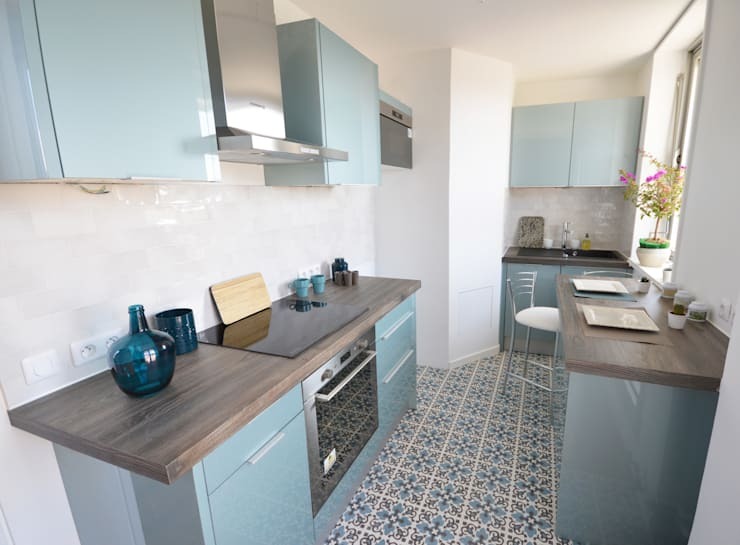 The old cement floor has now received a facelift, with a vintage inspired floral designed tile bringing some life into this now gorgeous kitchen. The blue-grey cabinets bring in a light and neutral tone to the kitchen, making it comfortable and not claustrophobic, while the steel appliances blends in perfectly with the chosen colour scheme. It's definitely a lot brighter and more inviting. 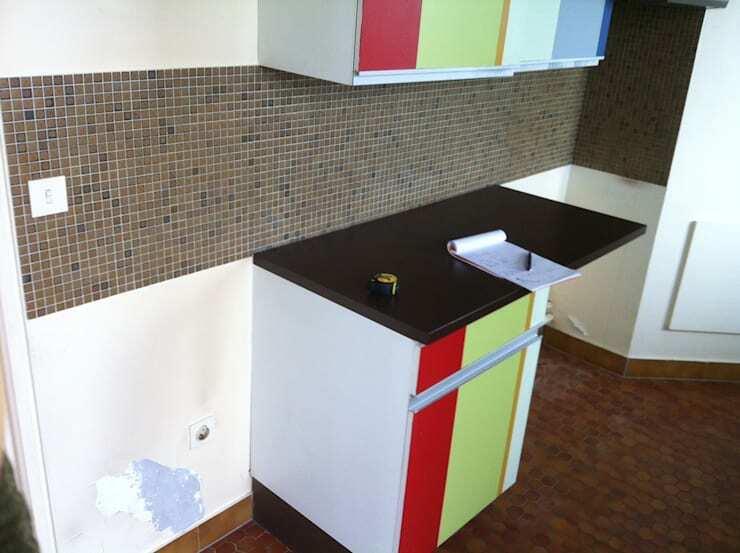 The old layout of this kitchen was impractical, with dull colours on the floor and work space that has not been defined. It needed a bold and intelligent design to create a comfortable cooking space. 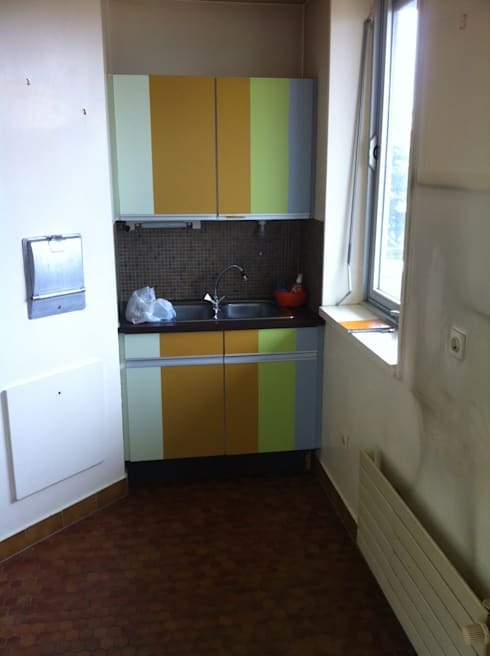 The kitchen looked almost cluttered with a design that was straight from the 1970's, but not in a good way. The old colourful cabinets were exchanged for this brilliant blue-grey option that now allowed space for an exhaust fan as well. The built-in oven saves space, while the microwave is now perfectly housed against the wall too, creating an uncluttered appearance. The mosaic wall tiles have been replaced with a shiny white tile instead, making the space light and bright. 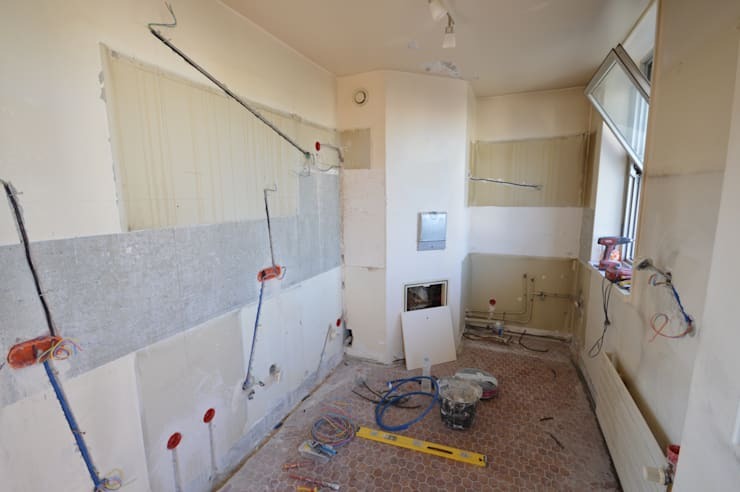 The damaged wall and odd coloured kitchen cabinets created a space that was unattractive and unpleasant. However, with so much potential, this kitchen now looks amazing! 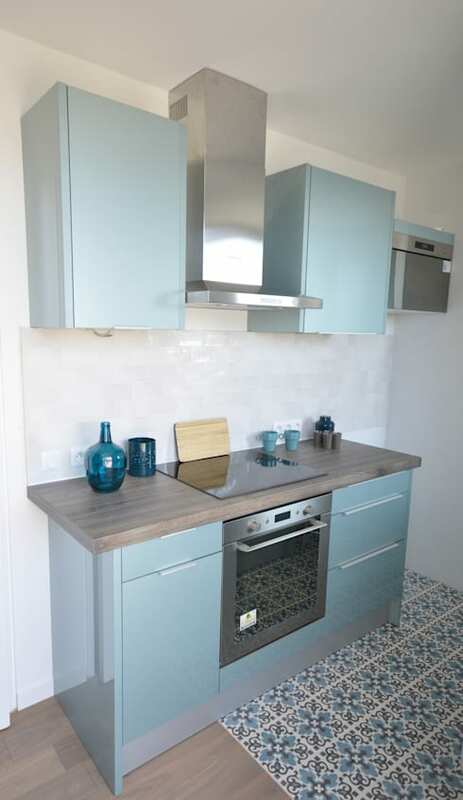 This blue-grey kitchen with pearly white tiles is now sophisticated and attractive! The window adds just enough natural sunlight to make the kitchen cosy and comfortable, while the informal dining area doubles up as a work space. Enjoy a romantic candlelit dinner for two and clean up quickly with the dishwasher safely stored beneath the sink. This beautiful kitchen is now comfortable and cosy, with wooden flooring completing the stunning finish. 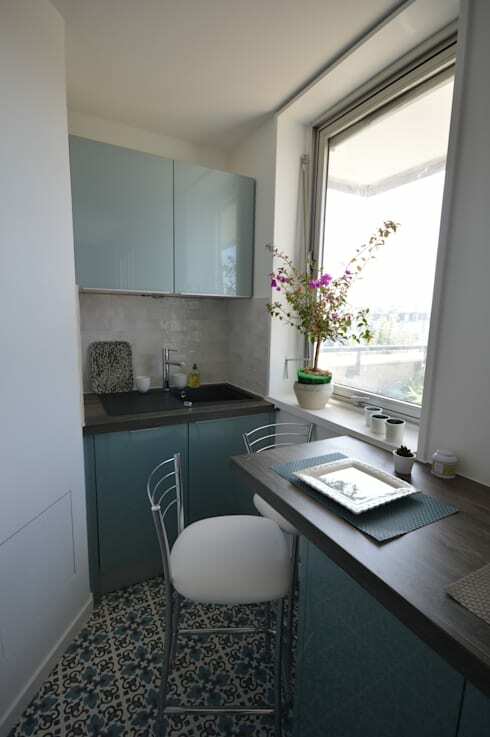 The wooden countertops and flooring is in the same colour, this was done to create a seamless design. 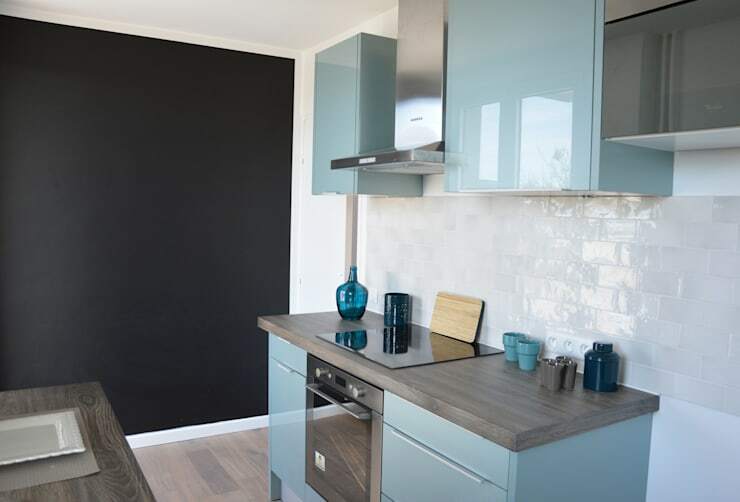 The black wall opposite the kitchen adds a striking contrast, making this kitchen even more attractive and bright! In need of more inspiration? Then these Five Kitchens Transformed Beyond Recognition! are filled with design ideas for you. What colour would you use for your kitchen makeover?